Writing Resources: No Plot? No Problem! Chris Baty: No Plot? No Problem! There are a million ways to approach writing a novel. You can outline your plot. You can create a series of scenes and use note cards to organize them. You can use a tried and proven formula from any number of plotting resources. Or you can create a couple of interesting characters and just start writing. In 1999 Chris Baty rounded up twenty-one friends and together they embarked on a journey like no other. With no map and no compass, they each set out to write a novel in just one month. Some of the crew got lost at sea. Others survived the voyage and reached dry land with scrappy but completed novels in hand. The result? One of the most celebrated writing events in the world: NaNoWriMo. “That [we] were undertalented goofballs who had no business flailing around at the serious endeavor of novel writing was pretty clear. We hadn’t taken any creative writing courses in college, or read any how-to books on story or craft. And our combined post-elementary-school fiction output would have fit comfortably on a Post-it Note.” — Chris Baty, No Plot? No Problem! Despite their lack of knowledge and experience, and despite the fact that more than half of the original crew went overboard, Chris Baty and his friends had unlocked one of the secrets of novel writing, and with that treasure in hand, Chris went on to found one of the most beloved and exciting writing events in the world. Today, National Novel Writing Month (NaNoWriMo) takes place every November. In 2007, the event’s ninth year, over 100,000 participants signed up from all around the world, and over 15,000 reported that they finished their novels. By 2017, over 400,000 people were participating, and the numbers continue to grow. National Novel Writing Month has been expanded with Camp NaNoWriMo, which is basically NaNoWriMo in months other than November. Some NaNos (that’s what participants are called) have even gotten book deals and published novels they wrote for NaNoWriMo. Others found that writing a book wasn’t as hard as they thought and went on to pursue a career in writing. A few discovered that writing a novel wasn’t the dream they thought it was and moved on to other endeavors. But every person who signed up and went through NaNoWriMo came away with a valuable experience and new wisdom about what it means to write a novel. I read No Plot? No Problem! in one night. It only took a couple of hours, and I enjoyed every minute of it. The book is straightforward and easy to read, but it’s also packed with humor. I found myself laughing out loud as I made my way through the chapters. More importantly, the book proved to be a useful addition to my ever-growing collection of writing resources. Chris takes you through his own journey to becoming a novelist and then dives into the lessons he’s learned and techniques he’s discovered. Much of his advice centers around plot development (which is no surprise, considering the book’s title), and I was ecstatic because plot was the one wall I kept crashing into every time I attempted to write a novel. I had plenty of characters, settings, and scenes. But no plot. Chris Baty solved that problem for me. Oh sure, he touches on character creation, finding time to write, and why you shouldn’t EVER revise while you’re still plowing through your first draft. But more importantly, Chris revealed ideas for tackling plot that I’d never before considered (or even heard about). A couple of weeks after I read the book, I diligently signed up for NaNoWriMo and hopped aboard my own ship. The voyage was sometimes smooth, sometimes rocky, but in the end, I reached the far shores as a novelist. And while I’m the one who wrote that novel, I have to thank Chris Baty not only for founding the event that led me to write my first novel in just thirty days, but also for his funny, insightful, and informative book on novel writing and plotting. Believe it or not, there is a plot lurking around somewhere inside that muddled imagination of yours. There are also characters, scenes, themes, and a whole lot more. No Plot? No Problem! will help you dig through the muck and unearth the novel that’s waiting to be written. 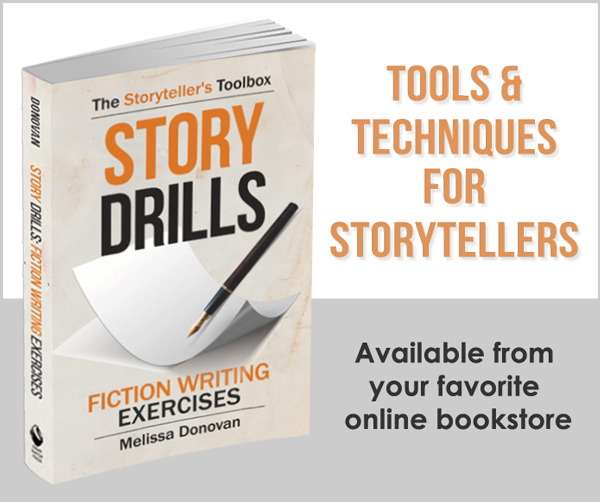 Whether you plan on participating in NaNoWriMo this year or if you just want to write a novel at your own pace, this is one of the best writing resources for starting and finishing your novel. My experience with this book is proof that by changing the way you approach novel writing, you can also change the outcome and finally succeed. Next time you have an idea for a novel or start a project, you’ll actually finish it! 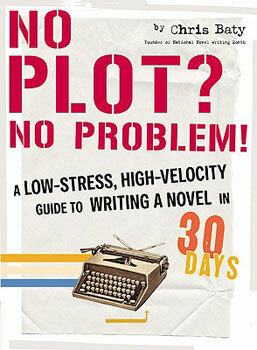 Get your copy of No Plot? No Problem! today. Hi Melissa .. thanks for the great resource. The timing’s not right for me now .. but perhaps next year. The challenge is interesting .. and yes I do have ideas – at the moment though my energies need to be and are elsewhere. Well done on completing the project last year – it’s good to be around writers and friends who know what they’re doing! Thanks for the resource ..
Hi Hilary. The timing definitely has to be right for a project like NaNoWriMo. I don’t think I can participate this year, but I’m hoping to give it another go next year. It was quite an experience — one I’d like to enjoy again. Yes, even if you aren’t going to do NaNoWriMo, the book is excellent. It’s the most enjoyable fiction writing book I’ve read yet! I read it once. I found some good tips in it too; but in some place there isn’t enough contract in the gray scale so it was hard on the eyes. But maybe that’s an age thing. My favorite tip from the book is to forget about quality and just write. After all, you can always edit, revise, and polish later. For the first draft, just get it written. That helped me immensely; it’s a lesson I’ll never forget. Hi Melissa: I like how he says to drop your standard from “bestseller” to “won’t make people vomit”. The best work comes from the enjoyment of doing something, not from the expectation of future rewards. I agree! When you take the pressure off yourself, you enjoy the work more, and the work itself will benefit. Ooh, I see you just published a post about Tarot as a Creativity Tool — I have to go read that (I love the Tarot for creativity; I have Rider-Waite). Hi! I’m was thinking about buying the book. I’ve always been into the idea of writing though I’ve never been able to finish anything. I’ve easily come up with characters, and how those characters meet and connect and etc. but finishing the story is something I’ve never achieved. I was just wondering what your first 30-day-novel-writing expierience was like and if you’re happy with the end product. Another problem of me is not being satisfied with the level of work I’m coming up with so some insight into whether or not this book could help with that type of problem could be great. I definitely recommend NaNoWriMo, especially if you keep starting projects but not finishing them. I had the same problem, and once I did NaNo, I realized that I could see a project through to the end, and I better understood how to do that. Am I happy with the end product? I doubt I’ll ever revise and publish it (but you never know). However, the value is in the journey and experience — if and when I decide to write a novel that I do want to publish, then I know exactly how to go about doing it. Think of it as a novel-writing exercise, practice. As for No Plot, No Problem — yes it was a big help. I absolutely recommend it. This looks like a great book! I totally agree with you that the most important thing is just to sit down and do it. You learn so much by just finishing a book. My book was just a gift to my wife, but I had so much fun writing it! Now when I go on to more serious projects, I know exactly where I’m going. I loved this book! It’s a fun read. Even I had registered for Nanowrimo last November but backed out. 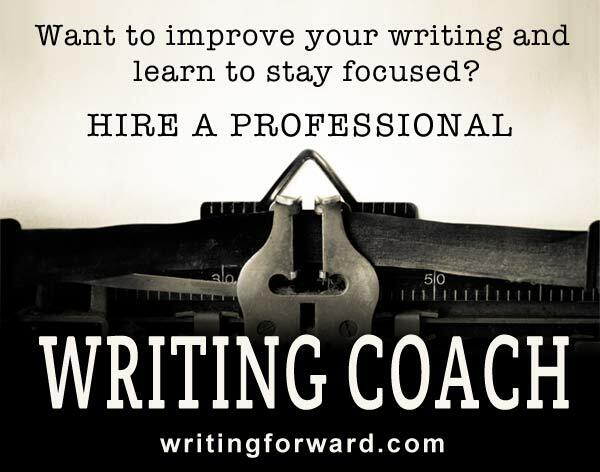 How do you choose in on what to write about?I mean there are so many ideas in a whirpool inside our heads.How does one pick one and write on it for 30 days? P.S: Finishing a novel in 30 days would be a great feeling plus it is a lot of learning. I think the key is to choose an idea that resonates with you and then see it through to the end. There’s going to be time afterward to tackle your other ideas. Look at it this way: it’s better to just pick one and go with it than to spin your wheels doing nothing.